​Research teams from NeuroSpin et the Service Hospitalier Frédéric Joliot (SHFJ) have developped leading in vivo imaging facilities, especially for molecular and functional imaging.  facilities are part of the National France Life Imaging (FLI) and are open to the scientific community. In addition, the arrival of the emblematic magnet at 11.7 T in May 2017 at NeuroSpin Department, built for brain imaging, is likely to bring NeuroSpin to an inscription on the road map of the Very Large Research Infrastructures (TGIR).